Of late, the popularity of adult tricycles has been on the rise. This is especially witnessed among the seniors and boomers who want to enjoy the outdoors while still exercising their bodies. This special kind of cycle provides better stability and balance courtesy of its three wheels offers better support and comfort, and some come in an easy-to-fold design. To keep up with the rising demand, different tricycles have been launched into the market. In these top 10 best adult tricycles in 2019 review, we will first focus on a review list of the best tricycles on the market and thereafter the buying guides. Enough talk now, lets us get right into business. The review below highlights some of the best adult tricycles that we’ve identified. Enjoy the outdoors with this Raven-styled tricycle by Komodo. Measuring 43 x 27 x 11 inches and weighing about 60 pounds, this stylish cycle can handle users weighing up to 240 pounds. The low-clearance cycle comes in an easy and simple design that allows a person to easily get on or off easily. It’s made from high-quality stainless steel and alloy materials and comes with a 6-speed Shimano gear for smooth and effective gear change. The large alloy wheels together with 32-spoke chain wheel make the ride smooth and very quiet while the large size wire basket allows you to carry stuff. Consumers love its low profile, easy to get on/off design, simplicity, smoothness, stability, durability and easy assembly. A few, however, complain that it’s not foldable. This 26-inch tricycle is targeted at adults who desire comfort, stability, and safety when riding outdoors. The 69-pound cycle consists of a light but sturdy aluminum frame and measures 11 x 52 x 31 inches. It features ergonomic and easy to adjust handlebars and seat. The comfortable seat/saddle offers good support and minimizes cases of aches and pain thanks to the good padding and shock absorbing mechanism. For smooth riding and simplicity, this item comes in a single speed while the linear-pull brakes offer good stopping power. In addition to its simplicity, basic design, and rear folding basket, consumers love its sturdiness and comfort. However, many don’t like the idea of having to assemble it. 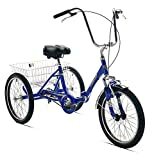 Coming in a dark blue color, the Pacific Cycle by Schwinn is perfect for any adult including boomers and seniors. It features a well-made and sturdy 16-inch aluminum frame that can support even heavy riders. The light bike weighs about 70 pounds, measures 11.5 x 31 x 50.5 inches, and comes with a low stand. The cruise styling together with swept back handlebars and well-padded saddles make the ride more comfortable and enjoyable. Users also praise this item for its light and sturdy alloy wheels, 26-inch wheels, lightweight, and easy riding. Unfortunately, it only comes in a single speed and the instructions aren’t very detailed. Although only weighing 70 pounds and measuring 15 x 15 x 20 inches, this aluminum-made tricycle can support users as heavy as 215 pounds. The highly stable and well-balanced trike features 20-inch 36-spoke wheels, 5.5-inch forged crank and is powered by a 3-speed gear system. It comes with a user-friendly step that is perfect for users as short as 4 feet and as tall as 6 feet. The portable and light piece can easily be mounted on a car rack. 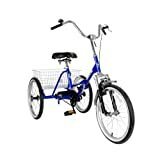 Adults, both young and old will find this elegant metallic blue trike worth buying. Users love the easy pedaling, smooth ride, easy assembly, and easy to get on design. Some don’t like its very basic nature and the not-so-clear instructions. With this silver/blue colored adult tricycle, riding with your spouse or on your own will be more enjoyable and exciting. The bike’s frame and fork are made from quality stainless steel while the rims are made from sturdy aluminum. It measures 30 x 43 x 64 inches, weighs 45 pounds and has a stand-over height of 19 inches. The simple design makes getting on and off easy and simple whereas the large and padded saddle offers good support and comfort. It features on these top 10 best adult tricycles in 2019 review because it’s well-made, simple to ride, looks awesome, foldable and is well-balanced. However, it missed the top spot because the instructions aren’t very clear and assembling isn’t very simple. The Komodo adult tricycle comes in an elegant maroon/white color and has a shipping weight of about 67 pounds. This aluminum bike measures 11 x 26 x 43 inches. The 24-inches tribe comes with a comfortable and sturdy seat, 6-speed Shimano gear system, and a large wire basket. The low clearance makes getting on or off easy while the decent-sized fenders protect the rider from dirt, dust, and other flying debris. It’s a good buy because it looks amazing, offers a smooth ride, and the gear system is very reliable. The only problem is it needs assembly before use and it’s a little heavy. Next, we also believe that this Raleigh Bikes Tristar Tricycle would also meet the requirements of those who tend to look for a good-to-ride trike. One of its special feature is a hand-brake lever which is built in locking-style. Thanks to this, you would receive a secure parking experiences, and you would also be prevented from falling down when the bike rolls back. Moreover, this trike also comes with a large comfortable saddle which will assist and make you feel comfortable even during a long period of riding. On top of that, thanks to the real mental basket available at the back of the bike, this allows you to easily carry many items along. Furthermore, this tricycle is ideal for riding in a neighborhood, as well as running to a local farmer markets. Also, it is suitable to the people of all ages. Add some fun and excitement to your life by acquiring this slate blue-colored tricycle. It measures 31 x 11 x 52 inches, weighs less than 70 pounds, and is made of high-grade aluminum. The stylish and well-balanced cycle comes with 24-inch wheels, cruiser style handlebars and wraps fenders. It features a comfortable and well-padded Springer seat that can easily be adjusted using the built-in quick release mechanism. It’s a wonderful tricycle because it’s easy to assemble, rides smoothly, and the parts are of high quality. The only shortcoming is that it is a bit heavy and assembly is needed. The Kent Adult Westport tricycle is popular with many adults including young, seniors and boomers. It’s loved for many reasons including its stylish and trendy blue color, strong steel frame, and stable and well-balanced design. The item comes with 20-inch wheels, user-friendly linear pull brakes, and easy folding designing for better storage and portability. The padded saddle and quality suspension fork provide a comfortable, smooth and stable ride while the rear cargo basket offers a good storage/ holding point. This tricycle almost made it to the top because of its solid engineering, smoothness, comfort, easy folding, and safety. Issues that deprived it of the top position include its large size that takes up a bit of space. Adults weighing up to 300 pounds should consider this black cherry tricycle by Schwinn Meridian. It’s made from high-quality light aluminum and weighs about 70 pounds. The elegant cycle features three 26-inch wheels, a folding rear basket, front linear pull brake, and rear handbrake. To offer a smooth ride, it comes with a single speed while the quality and well-padded saddle provide the desired comfort and stability. People like the 31.5 x 12 x 51.5-inch cycle because it’s easy to ride, very comfortable, the ride is very smooth, it’s well-balanced, stylish and also stable. Others nonetheless complain that it isn’t very fast. Size: It’s vital to choose a cycle that isn’t too big or too small. The correct size is influenced by your height, weight, and age as well. Comfort: Tricycles generally are used for cruising and riding slowly through the streets. A good type comes with a decently sized seat/saddle that provides good comfort. The suspension will also reduce the shocks, road vibrations, and impact. Weight: Top tricycles are lightweight but very strong thanks to sturdy materials like aluminum. They also come with tough welds and seams to support heavy users without breaking. Ease of use: The item comes in a simple design and is easy to use by first time users and seasoned riders. The chain link, suspension, tires, and saddle all play a part in making the cycle user-friendly. Stability: The right tricycle comes in a good design and wheels and offers optimum support and balance. A poorly balanced bike will not only affect the enjoyment and stability but is also risky. Type: Different types of tricycles are available in the market and the suitability of each varies from user to user. The most common are electric, folding, semi-recumbent, low step, chopper, heavy duty and double tricycle. Gears: Basic bicycles come with a single gear and don’t require changing in different terrains. tricycles, however, require more effort to go uphill or on inclines. The higher the gears the easier and smoother the ride. Nonetheless, the user needs to know when to change the gears and this may be a challenge to new users. Safety: You are advised to settle for a cycle that is rated highly in regard to safety. The frame will be strong and sturdy, the balance will be right, and the brakes are easy to use yet very effective. Personal preference, design, cost, brand reputation, and trend also play a vital role in the selection and buying process. Finding the right adult tricycle isn’t as hard as you may think or have been made to believe. With the right information and knowledge, you will not only identify the right product but will also save time, effort and money. We took time and reviewed different products on the market basing our analysis on reliability, stability, user-friendliness, comfort, effectiveness, maintenance ease, and durability. The above adult tricycles came top on our review list. They are well made, sturdy, easy to assemble, comfortable and offer a smooth and enjoyable ride. Additionally, they have and still continue to receive positive reviews from both consumers as well as experts. If you desire the best accessory or would like to gift someone the best, all you need is using this top 10 best adult tricycles in 2019 review as your purchasing guide and selecting an item. Finding a tricycle for kids is not problem. However, when it comes to finding an adult tricycle that can meet most of your requirements is quite challenging. To get the perfect tricycle for your needs, there are many things that you need to take into consideration. These include design, seat, speed, and whether or not it is comfortable to ride. In this article, we are on a mission to help you find the best adult tricycle that would best fit your type and needs. First off, we would like to introduce you this Mantis folding tricycle for adults. If you are ones of the people who like to ride bicycle without the worry of falling down, you should then take a look at this product. With a good-look design, this product does not only look cute, it also offers a very comfortable ride. Moreover, this bicycle is built in high quality materials which make it durable to use. Other than this, it also allows any adult with small frame to ride easily because it comes with low cut frame. Being designed with parking brake in low-cut style, this bike is very convenient to be mounted or dismounted. On top of that, it is also available in a large spring seat which will not make you difficult in riding it even in the case of a long ride. Those bold enough to experience a bit of adrenaline rush should opt for this multi-colored trike. Made from high-quality stainless steel and featuring BMX-style platform, this cycle offers great speeds thanks to its electric motor and rechargeable lithium-ion battery. It comes in a very low profile for added stability, better control, and safety. Measuring about 9.45 x 13.58 x 16.93 inches, the quality trike only weighs 8.8 pounds and comes with an easy-to-carry and store design. Its positives include fast performance, easy to assemble, and strong construction. The downside is that it’s a bit low on the ground and may be a bit too sporty or fast for some seniors. Coming further, this Goplus Adult Tricycle should also be introduced. There are many reasons that this product would catch your attention. First of all, it is available in a single speed that only allows for simple ride. Because of that, this becomes very ideal for elder people and those who have difficult time riding a bike. Besides that point, this tricycle is also made from many durable materials, for example, durable and steady steel. By this, the trike itself will not be easily damaged or broken. The trike becomes more attractive because of a large basket at the back. This large basket allows many things to be stored which is very convenient when going to the markets. Other than the basket, this tricycle also comes with a bell which is really cute. Moreover, this trike also possesses a double brakes. Because of both rear hand brake and front brake, this tricycle will be stable when you get on or off. Lastly, this bike is designed in user-friendly style that allows you to have a good and easy time riding it. Another product continued on the list is Raleigh Bikes Tristar 3-speed Trike. This trike is perfect to people of all ages. Whether you are a teenager or an adult, you can always ride this. Also, this tricycle is ideal for a neighborhood ride, or riding at the farmer markets. Other than this, this tricycle also comes with a mental basket which is really convenient to store many things. In addition to that, you would never experience any pain when riding this trike for a long period of time. The reason is that it has a large spring seat which provides you complete comfortness. Thanks to its hand brake lever designed in locking mode, you can have easy time parking your bike without rolling backwards at all. The first thing that you would love about this tricycle is its user-friendly design. Whoever rides this tricycle does not always encounter difficulties when getting on or off. Because it is stable and available only in a single speed, it is very perfect for elder people and those who do not know how to ride a bike well. Besides being easy to use, this tricycle is also easy to be placed in storage. The users can either store it in the trunk or placed it inside any minivans and station wagons conveniently. Either folding or unfolding it will only take you a second. Moreover, there is also a large basket available at the back of the bike as well. The basket is large and also capable in carrying a lot of thing. This bike is also useful for a long vacation at the beach because it allows you to store chairs, umbrella, and other things all in once in its basket. And now you see how useful, strong, and cool this tricycle is. Then, we would also like to introduce you another folding tricycle namely Mantis Tri-Rad. This tricycle is perfectly suitable for elder people as well as those who have down syndromes. Coming with a single speed, the users will not experience difficult time of getting on or off the bike. Moreover, this tricycle is also made from high quality materials that makes it durable to use and stable to ride. This bike is also foldable which is really great to take on vacation or any adventure. It does fit to any storages such as trunk, minivans and station wagons. On top of that, the seat is also large and comfortable to sit on which will never give the users pain even for a long ride. By owning this, you would really enjoy riding it more than driving to any local places. Coming to the first product on the list, Kent Adult Westport folding tricycle is what you should not miss. When riding this tricycle, you need not feel worried whether it will break. This tricycle is actually built in strong steel frame and step-through design which will last for years. Also built in suspension fork, you would never feel bumpy at all whenever you ride across the holes or rocks. Moreover, this bike also has extra large seat that will provide comfortness when you ride in a long period of time. You can also adjust your seat by nothing but moving the handlebars. Other than that, this tricycle also comes with a handy cargo basket that allows you to carry many heavy items along when riding it. This tricycle is also easy for any kind of storage because it is foldable. To find the perfect trike is not easy. However, we believe that by reading much about tricycles, you would at least be able to find the one for your preferences. The 7 adult tricycles highlighted above are the best selections of all times in 2019. Then, if you have already found one, all you need to do is a click to order so that you can get closer from owning it. Well, Adult Tricycles sometimes called as “Trikes” have been around for hundreds of years now, but only recently have they made a resurgence and gained an explainable attraction amongst people of all ages especially seniors. These 3-wheels-adult-tricycles are, made for a slow and relaxed riding style; hence, making them a personal favorite for women and older people. Adult trikes nowadays can be quite the speedsters plus the durability and stability of its. Therefore, you don’t have to struggle to maintain balance. Others come with a big basket for tricycles that allows you to ride and also use it for transporting groceries, packages, and running errands. Trending in most cities around the country is the prevalence of adult tricycles. The word may come as a surprise for many, truthfully, the word “adult tricycle” does not sound cool especially, given the fact that many people associate a tricycle with kids. However, I can tell you that riding one is not only cool but also fun and useful. Be forewarned, everyone around you is going to desire to ride your new tricycle bike. Am I right? With the sea of adult tricycles in the market, it can be quite daunting to pick the best one for you. Below, we highlight the factors to consider when buying, as well as detailed reviews on some of the best trikes in the market. The best adult tricycle is one that provides performance as well as comfort. But how do you go about finding one? If you are doing research on what best adult tricycles to buy, here are a few general factors you might need to consider. Ensure your tricycle is big enough to accommodate your weight. Not to worry about this, most tricycles are designed to carry more than 300 pounds. If you need a tricycle that you can use for riding and be carrying a load, you will need to choose a tricycle fitted with a basket. The tip is to ensure you choose one with a large basket. Some trikes are estimated to have a handling capacity of more than four grocery bags. If you choose to ship your tricycle, you must keep in mind that it will not come assembled and quite often or not, the directions can be quite difficult, and you might be forced to call a professional which means incurring additional charges. Therefore, it would be important to purchase a pre-assembled tricycle. Having a lighter frame means you have less effort when pedaling. An aluminum frame is the best for pedaling. One of the most important factors to consider before buying a trike is whether you are going to use it on the road or a rugged terrain. There are different styles of adult tricycle that you can choose from, on our list we have a wide selection of the various styles of trikes to choose from that will fit your needs and style. It doesn’t hurt to get additional functional features since there is more room for the strikes frame; there are often great deals of added beneficial features you can choose. Keep in mind; it is worth checking out this bonus. The first tricycle in our review is the Mantis adult tricycle; if you are looking for a comfortable and worry-free ride. It would be a great tricycle to go. This tricycle is endowed with a variety of functional features that will please any riders regardless of their age. This product features front alloy linear pull brakes with an additional parking brake, a folding steel frame, a front fender, a rear basket with steel plastic coated and a front fender. It also comes with some additional features such as a bell and a chain guard. The wheel size is 20 inches and a weight of 300 lbs. This is a high-quality tricycle ideal for picnics and running errands. It is from Japan with a 6-speed Shift and a high carbon steel step-through frame. This product is made from allowing rims with smooth riding tires and a comfortably padded spring. Besides, this strike is very safe and has been innovatively designed to be not only function but a fun experience for the rider. With this tricycle, you not only get to express your style, but also get to ride an accessible, yet safe three-wheeled tricycle. This tricycle features an efficient and reliable brake system, a large cargo basket, an easy access setting access, high tensile steel construction frame designed with authentic Shimano 7 speed Revo twist shifters for effortless pedaling and shifting as well as, enough room and large wheels. If you are afraid of falling off a bike and you need a bike designed for stability, this adult tricycle is for you. This tricycle bike features 6-Speed SHIMANO RS45 shifter and SHIMANO TY-21 derailleur, a small step-over. Also, you will find that this product has comfortable seats and the springs underneath the bumps almost go unnoticed. Moreover, this product comes with fitted handlebars plus a convenient large basket for storage. The most amazing feature that this adult tricycle possesses is that it is a 6-speed adult tricycle; this means that it is not that different from a regular bike. If you like looking good on the road, this is your ultimate go to bike. It comes in red. This tricycle features 20-Inch rear wheels and 24-Inch front wheels are a unique facet that provides more stability than one sized wheel. Another amazing feature is the enabled 3-speed factor fantastic speed and sense of riding which achieved with the courtesy of Sturmey Archer 3 Speed Internal gearing coupled with a twist shifter. Besides, the adult tricycle comes with an oversized tubular fork that enhances safety and the overall wellness and builds. The first thing that comes to mind when you look at this tricycle is a big wheel for adults. However, don’t let the first sight of this amazing tricycle fool you. This adult strike comes with a variety of functional features that you will not only love but will work tremendously for you. For starters, this adult tricycle has a high-quality steel strike frame combined with super slider wheels, Front free-wheel with alloy crank and BMX style platform pedals. Plus, grip tape on the rear axle, adjustable bucket style seat, moto-style handlebars, Triple Crown fork, pro-style grips, and tow hook attachments. Are you looking for a starter bike? You are in luck, the Schwinn Meridian 24- inch adult tricycle is one of the best strikes in the market today. This tricycle is manufactured from a high-quality, sturdy frame that allows you to mount on it without straining your back only. This product features, super low stands for easy access, 24’’ alloy wheels, a convenient large fold down grocery basket that makes storage pretty easy. Not to mention, this tricycle has a swept back handlebars for added comfort, and a cruiser styling infused with full wrap brackets. This tricycle comes from Kent internationals. It is a great deal for anyone looking for a rider bike or would wish to revisit their youth. The Kent Westport 3-wheeled adult tricycle has a strong frame and is super sturdy innovatively designed with a step through design.Also, it is extra wide and comes fitted with a comfortable seat plus adjustable upright handlebars. Also, this tricycle is equipped with linear pull brakes, a folding frame for easy storage and 20-inch wheels. The best part about this tricycle is its handy large cargo basket conveniently tucked behind the rider for carrying cargo other than that, this tricycle designed with suspension fork cushions that make the ride comfortable on a bumpy ride. This tricycle is quite the eye holder. It is stunningly designed in a modern and sleek design. Riding due to its three-wheel function is easy. This adult tricycle features a single speed, lightweight aluminum, and step through the frame as well as smooth riding tires that can ride through a variety of terrain and alloy stainless steel spokes. Besides, this adult tricycle is comfortably padded on its spring cruiser saddle and has upright handlebars. Another fantastic feature of this tricycle is the folding basket it comes with ideal for groceries and set up a picnic. To add to that, the front linear pull brake is reliable for precise and sure stopping hence making it safe every time you are on the road. Our first pick in this review is the premium strikes all terrain KMX Cobra adult tricycle. When it comes to a tricycle that has it all, you can always count on this strike. Plus it is an easy ride and suitable for all ages. If you are up for the ride of your life, this recumbent tricycle will help you achieve that. This tricycle features a KMX Hardshell Bucket Seat that comes with an adjustable lumbar support plus multiple angle seat positions that make it easy to find the seating position that works for you. As you can see, there is a myriad of reasons to choose an adult tricycle over a regular bicycle. While some bikes are assembled for maneuverability, some are built for speed and others are made for comfort. Mostly every single component of the adult tricycle has been carefully designed to suit your individual needs and so if you have never ridden one before, you’re certainly in for a treat.